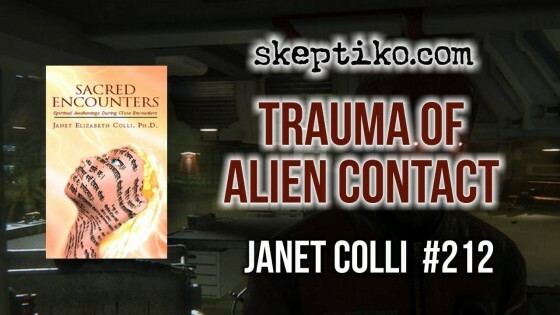 Interview explores the trauma and eventual spiritual transformation of those reporting alien contact. Alex Tsakiris: Suppose you have an Iraqi war veteran who walks into your office and says, “I’m suffering post-traumatic stress syndrome,” which 20 years ago was highly controversial, but now we’d say, “Okay,” and you’d have a series of protocols you might take that person through. What are the limits on what you can do with someone like that versus what you do with someone who comes in and says, “I think I had an encounter with alien beings and I’ve had this for a long time and it’s really causing me a lot of stress.” As a clinician, how do you deal with those two situations? How are they similar; how are they different? Dr. Janet Colli: I would say that the nervous system doesn’t make up trauma. The signs of trauma are pretty well recognized now. That knowledge and those experiences pretty much overwhelmed all of the questions of are people making up things? You want to treat it as trauma and to some degree respect what people are saying even if you yourself are not sure of the so-called objective reality of what happened. You want to be treating that using trauma methods. I use the EMDR a lot, Eye Movement Desensitization and Reprocessing, and it really does help the nervous system process things that are difficult. Dr. Janet Colli: How would you characterize your audience, if I might ask? Alex Tsakiris: No, I’m glad you did. My audience is very open-minded and progressive-minded so we just call the skeptical nonsense for what it is and say, “That’s just a crazy, irrational worldview that just really doesn’t make sense.” But in the spirit of doing that, I think we have to remain skeptical as well, and when we get into consciousness there are a lot of different people saying a lot of different things out there. The example I always use is reincarnation. I’ve had on a variety of people, respectable people, and they’ll tell you anything from it’s an illusion, it doesn’t really happen and that they’ve ascended to the next level and their spirit guides are saying there’s no such thing as reincarnation. Or someone will say there are multiple, simultaneous reincarnations at the same time. I just heard that from my last guest, Dr. Julia Assante, who is really bright and has written a book that a lot of the top people really, really like. I’m okay with that. But then that flies in the face of somebody else who says that from the old spiritualism of the early 1900s we learn that you could reincarnate three times. Dr. Janet Colli: Yeah, okay. A good rule of thumb is I’m not out here to convince anybody. I’m going to share my experiences and maybe some of the people I’ve worked with or know of and share a perspective. By sharing that, if it opens up somebody else’s mind or causes them to see or think in a new way, that’s great. But I won’t try to convince anybody because that’s where we run afoul, see? As you say, you have to live it. Nobody else is in my body but me, right? So if I could do a Vulcan mind-meld that might work but I can only open up a window into my reality and you can look in a bit. But ultimately I’m not walking around in your shoes and you’re not walking around in mine. So I’m not going to try to convince anyone that aliens exist or not. It’s just if you want to know what it’s like to be in this world, I can share that. I can share a bit of that. That’s when it gets interesting. Alex Tsakiris: The experience thing is tricky, too, right? I’ve run into people who say, “Well, this is my experience. I’m sorry. This is my experience.” It’s like, wait a minute. This is the game we’re all playing is this consensus reality game. I can compare my experience to your experience and then I can compare it to a larger body of experiences and I can glean something out of that. Alex Tsakiris: Today we welcome psychotherapist and author, Dr. Janet Elizabeth Colli to Skeptiko to discuss her book, Sacred Encounters: Spiritual Awakenings During Close Encounters. Yes, we are going there with close encounters. So Dr. Colli, welcome to Skeptiko. Thanks so much for joining me. Dr. Janet Colli: Thank you for having me. This is great. Alex Tsakiris: Well, it’s going to be an interesting ride. Your topic, your book, is obviously going to be very controversial to a number of people. I can only imagine some of the conversations you’ve had with your colleagues. Maybe we can get into that at some point. What I thought we might do is just start with you telling us a little bit about yourself and in particular, about your training as a psychotherapist. Dr. Janet Colli: You know, I just had a story published in Bernie Siegel’s book, A Book of Miracles. It’s about my experience with cancer. I would have to say that that’s a real starting point for me in how I got into doing my work as a psychotherapist. My write-up is in that book and my experience in healing was extraordinary. And that is how I got into working with people that have other extraordinary experiences. Alex Tsakiris: So your experience with cancer led you to want to help other people. So you’re a therapist now. What kind of patients do you work with? Dr. Janet Colli: I work with all kinds of patients, all kinds of clients, but the work I like to do best is transpersonal work. Transpersonal work generally has some aspect of trauma in it. So you have to have a firm grounding in trauma, which is why I studied clinical psychology. I take off from that foundation into the transpersonal. Now, close encounters are going to fall into transpersonal psychology. It’s going to be non-ordinary. You’re dealing with altered states. So I did my graduate work with a firm foundation in clinical psychology but you’re taking off from there and you’re including work with the numinous, the sacred, the non-ordinary, and what is outside the box. I knew I wanted to study close encounters because I read one of the best cases in Ufology that exists and I resonated. I knew that this woman was in an authentic mystical experience and I wanted to study that. It wasn’t until I had cancer that I had the real grounding in my own personal experience, and that’s so necessary. You have to have some way to identify with or resonate or have a sense of what the people you’re working with are talking about, whether that’s some form of trauma or abuse and dissociation, which guess what? That’s an altered state, too. Or if you’re dealing with the sacred. I hope I’m giving a little bit of a perspective. I’ve been working several decades now so at this point I’m kind of looking back and it’s beginning to make more sense than it ever has. Alex Tsakiris: Yeah, I’m still flying into this from the top level down. Okay, transpersonal psychology. That, I think, is still pretty controversial within the field of psychology as a whole. My wife is a psychologist and used to be a clinical therapist and when transpersonal psychology was really first getting its feet on the ground 20 years ago, I think it was much more controversial. What is this state of transpersonal psychology? How is it accepted within the psychology community? Dr. Janet Colli: You know what? I wouldn’t say it’s so much not well thought of as it is dissociated from the rest of psychology. It’s out there in its own world. There is literally no bridge between clinical and transpersonal psychology. That’s why I wrote my second book, The Dark Face of Heaven, which isn’t out yet, because I wanted to provide that bridge. And the bridge is trauma. There’s so much that needs to be integrated when you have an experience that’s outside the box. In one way or another you’re dealing with an aspect of trauma. Alex Tsakiris: Isn’t there somewhat of a grudging respect for transpersonal psychology as it’s evolved over the last 20 years to at least acknowledge that there’s a whole bunch of people that seem to be having experiences that don’t fit neatly into traditional clinical psychology? So there are these experiences and we have to deal with them, be they religious experiences, be they these other kind of anomalous, kind of psychic experiences, or really fringy, being these kind of close encounter, contactee experiences. So big picture, hasn’t transpersonal psychology made a little bit of headway there? Dr. Janet Colli: Well, if you look at the field of near-death studies, everybody now knows what a near-death experience is. You can tune into The Simpsons and find the dog having a near-death experience. So sure, yes, there have been inroads. But the field [transpersonal psychology] is largely disconnected and dissociated. Frankly, I think the role that trauma plays in both clinical and transpersonal psychology is the bridge itself. Alex Tsakiris: That’s your thesis. I mean, that isn’t established. That’s just what your medical work is telling you. Alex Tsakiris: But that, of course, is extremely controversial and not a lot of people would jump onto that bandwagon right off the bat. I think part of the reason is that when we start talking about these non-ordinary experiences, don’t we have a real problem in terms of once we go there, once we leap over that chasm and say consciousness exists on these other non-ordinary levels beyond our day-to-day world, isn’t it kind of a free-for-all? Can we really put that back into an organized, systematic way that we feel comfortable with from an academic or clinical psychology, from a medical perspective? Can we really get there or is it always going to be this inability to integrate these two worlds? Because that’s what I hear. As soon as you start talking about that, that stuff sounds way out there for most people who are grounded where clinical psychology is in the mainstream. Dr. Janet Colli: Well, there is the thing of the topic itself is studied differently. It’s experienced differently. You can’t take a very non-linear experience and then provide just a linear frame to it. John Mack—I don’t know if you’re familiar with his work, the late Nobel Prize-winning psychiatrist who worked with experiencers or alien abductees, as they were called about a decade ago. He would point this out a lot, that you cannot study this in the same way. The topic itself you need to be open to a different way to look at it, as well. So I guess I’d have to say that’s the exciting part about this. You start out with a very solid foundation, trauma. You study clinical psychology. You study how to work with altered states, of abuse and dissociation, but then once you’re on the path you start to evolve as well. As a clinician I can only say that working with people that have had these encounters, it opens up the door to a different way to experience life myself. So I can’t remain in the old view of science being totally objective, etc. now that we know that’s just not how it is. Alex Tsakiris: I think it’s challenging. By the way, I think Mack won the Pulitzer Prize, not the Nobel Prize, but I get your point. Dr. Janet Colli: Oh, Pulitzer. I’m sorry. Alex Tsakiris: That’s okay. I get your point. It’s challenging, right? And there are some risks associated with that because certainly, as a clinician, getting too close and losing a little bit of that perspective can be problematic, as well. How do you deal with that? Let me put it in terms of you have an Iraqi war veteran who walks into your office and says, “I’m suffering post-traumatic stress syndrome,” which 20 years ago was highly controversial but now we’d say, “Okay,” and you’d have a series of protocols that you might take that person through. Dr. Janet Colli: There are some similarities in the sense of if you deal a lot with people with PTSD, with war trauma, you’re probably going to get to a point where you have to watch for burnout, right? You have to watch that you’re not vicariously experiencing their trauma, that you’re not also being traumatized yourself as you treat them. So it’s similar with dealing with non-ordinary. You want to be able to tell when you yourself are slipping into the paradigm that they’re presenting so you have to be aware of it. There’s no way you’re going to be able to totally wall that off. That’s where the therapeutic alliance comes in. Alex Tsakiris: What about more on just a practical sense? We’ve also lived through in the last 20 years the whole controversy, still unresolved, of repressed memories, false memories. Just on a more basic level, people having hallucinations or just inventing stuff, confabulating, right? You have to deal with that. That’s part of a therapist’s job, too. Alex Tsakiris: Hold on. Let’s back up and tell people a little bit about EMDR because I think in a way it’s a small case study in some of the topics that I’ve just been probing. From what I understand, the clinical research on EMDR is quite strong. Every way they’ve tested it, it’s found to be efficacious and in different modalities for different treatments, all this stuff, and yet there is still this resistance to it because what is really the theory behind it and all the rest. So in a lot of ways it encapsulates some of the discussion we’ve been having. Can you backfill in some of the sketchy details that I have there and tell us a little bit about that? Dr. Janet Colli: It’s a bilateral stimulation and it’s not just with eye movements but that’s how it’s [EMDR] started. Basically you just move the attention of the person from one side to the other, from the right to the left and the right to the left again. That helps the brain—that’s kind of what happens during REM sleep, you know how your eyes move back and forth when we’re dreaming. We’re processing material and that’s what you do. You just initiate the brain’s natural healing mechanism with that either through eye movements or bilateral tapping. I’ve used this with all kinds of difficult situations but I just want to point out that if people who have had any kind of non-ordinary experience can get themselves to a mental health professional and ask for EMDR, it can really help to bring them out of whatever state of difficulty they’re in. I’ve used it with people with what I considered to be close encounters and it helps a lot. It’s just that at this point, when I talk about transpersonal psychology being dissociated from traditional psychology, it’s that people don’t realize that you can actually go to a therapist and say, “I want to work on something that was really scary for me when I was out of my body.” If you can find somebody that’s open, it really does help. We’re just in the last few decades realizing the prevalence of the incidents of sexual trauma and childhood abuse. People go to therapy now for that. I wish people would begin to be more open to dealing with the non-ordinary in a therapeutic setting. That will evolve and heal some of this split that I see between transpersonal and clinical psychology. People who have had close encounters, for example, they may not tell anybody about this for decades. I may be the first person they tell, okay? They come in and you can see they’ve had to dissociate this and they’ve held in some really hard-to-deal-with aspects of it. That doesn’t do you any good. Alex Tsakiris: And maybe there’s a reason to be cautious. I came in contact with you, Dr. Colli, through Mike Cleland at Hidden Experience podcast. Mike tells an interesting story on his show about living in a small town and having a lot of feelings, depression associated with these experiences that he’s had, these anomalous experiences, and he goes in to see a therapist. Again, he doesn’t claim to have a contactee experience. He just claims to have these rather unique anomalous experiences. After a session, she goes, “Here’s the medication. You’re disturbed. Consider checking yourself in,” kind of thing. So the reality that people are going to find if they do seek help is just a wide spectrum of health care that they might receive. In a funny way it goes back to even though I don’t like the way that you packaged it in terms of the therapist is really this partner and it’s all about their experience and we can’t get any kind of separation from it, clearly that is the case. I guess we should probably be more open about it and say that therapist is bringing a whole set of beliefs and preconceived notions to the table that can really play into this whole thing. Dr. Janet Colli: Now I want to be clear. I’m not saying there is no separation. I don’t think I’ve said there is no separation. I’m saying there is a separation but it’s not going to be some objective reality and wall that we put up where we’re the clinician over here. We’re the scientist over here and over there is the patient. I’m saying you’ve got to participate in some way with these numinous experiences. Everybody that studies it deeply, whether it’s the near-death research or studies, people are impacted greatly by just listening to this, okay? So I just wanted to acknowledge that. I don’t say that it’s entirely without boundaries. Of course not. Otherwise I wouldn’t be a doctor. Alex Tsakiris: There are all sorts of boundaries. You know, I had a conversation a while back with a guy I really like. He’s the head of the Religious Studies Department at Rice University. Dr. Janet Colli: Yes, Jeffrey Kripal. Dr. Janet Colli: Isn’t that interesting that we’re all going to have a different crazy line? Alex Tsakiris: And doesn’t that create some real problems? On one hand, I appreciate his honesty because we all do have kind of a crazy line. But on the other hand, aren’t we constantly redefining this crazy line? Dr. Janet Colli: That’s a good point. You know, it’s interesting you’re talking about him. He’s going to do the Foreword to my second book. Alex Tsakiris: Make sure you don’t go over the crazy line. Dr. Janet Colli: He very much shares my view that trauma can be the introduction into the numinous and into the sacred and so we have common ground. We manage to cross our own crazy lines into a common ground ourselves and if we can do that, I’m sure many other professionals can. Oh, I do want to touch upon what you said about going to a mental health professional. I just want to say that if you get somebody that tries to diagnose and prescribe you in a way that you don’t feel is appropriate, then you move on. But you don’t stop there. Nowadays, people are finding me by looking under “spiritual emergency” or “transpersonal” as well as “EMDR.” And there are other clinicians out there. But don’t stop there if you have a sense that their treatment and their perspective doesn’t work for you. Move on. Even if you’re going to have to push it’s going to be worth it. I just want to say that. Alex Tsakiris: So, Dr. Colli, you’ve written this book, Sacred Encounters: Spiritual Awakenings During Close Encounters. People get it right from the beginning what you’re talking about. Can you for a minute play a little game for me? I want you to play Devil’s advocate for a minute because I think it helps define for people this idea of the crazy line being a little bit fuzzier than we think it is. I think we walk around like Dr. Kripal, who’s a great guy but has this rigid crazy line and not realizing that that crazy line’s a lot fuzzier than we think it is. I think pressing up against that and realizing it’s more fuzzy is a very freeing thing. Dr. Janet Colli: The question isn’t how would I explain it away. The question is what do I find along with it that I also have to watch out for or just be aware of. We used to have a sense that people who have had these experiences are whacko. They’re going to be diagnosable and abnormal and maybe even schizophrenic, okay? That view has changed in the last decade. I brought up John Mack before and he took great pains to point out that all kinds of people have had these experiences and professionals have had this. We like to outline all the many different kinds of people that have these encounters. So that took place within the last decade. What I would say now is what I also see is that you can’t say either way. You can’t say just speaking to this makes it authentic or makes a person a candidate for mental illness. You’re going to have cases that bridge both. You’re going to have cases where you can see something has happened but maybe the framework of the person’s personality is going to make the experience incoherent. You see? Now that’s a tricky one. Do you understand what I’m saying? So you can have somebody with a personality disorder so that their psyche cannot handle the energy. But you can tell that there’s been something that—I’ll just use the word numinous again—or something extraordinary that they’ve encountered. You’re not going to get a really good, coherent picture of it because of the nature of their psyche. So I’ve gone beyond either saying these people are either perfectly ordinary or these people are absolutely mentally ill. This tells me that I’m on the right track because you’re going to have this with any phenomena. You have people going into war and you may have somebody who’s totally unfit for that situation and they crack up, okay? So they’ve been subjected to a trauma that their psyche simply can’t process. We know that war trauma is real. Well, it’s the same for this phenomenon, so I have to be aware that the psyche is a container of itself and it can only handle so much stress. They shift to a dynamic that is more efficient and effective and a higher-order one or they crack under the strain. So the most interesting thing to me is where is that balance when you’re working with someone? What can you tell about the actual experience apart from the person that’s sitting across from you and how their psyche has dealt with it? But I’m pretty clear at this point that I’ve seen enough and I’ve certainly researched enough that there is something out there. I would even go so far as to say beings that are non-human that are of higher-order of intelligences and that we can have interaction with and that we can gain enormously from the interaction and evolve. That’s exactly what’s happening, I believe, on the planet. Alex Tsakiris: And you believe that because of your clinical work with people who say they’ve encountered these beings? Dr. Janet Colli: Oh yes. Alex Tsakiris: And your entry point into that is trauma. Take us through that connection between what you just said, the trauma that these folks have experienced and your conclusions that 1) there are beings that they’re interacting with, and 2) that these beings are of a higher-order of consciousness. Dr. Janet Colli: Anything that is outside your ordinary paradigm is going to potentially be difficult to process. If you encounter something that is outside of your view of reality, outside of your paradigm, that’s going to have to be processed and your view of reality is going to have to expand. That’s what I mean when I say these experiences have the potential for expanding one’s consciousness. It can be physiological, as well, because once you’ve been through something that’s incredibly traumatic and you heal from that, generally you’re going to have a wider range of responses. You’re going to know something about how to be in your body under great stress. So dealing with the trauma is the first aspect. Anything extraordinary has the potential of being difficult or traumatic, even if the upshot of it is positive. Then how do you get to the point to support what you just said, that what you’re working with is people who have encountered other beings of a higher-ordered consciousness, beings from outside of our solar system. How do you get to all that? Dr. Janet Colli: Okay. So the first part was trauma. The second part is the higher-order intelligence or the higher-order consciousness that people are capable of experiencing or entering as a result. What I’d like to say is—and this goes back to my mentioning again and again, transpersonal psychology, which deals with non-ordinary or altered states of consciousness—that people have had experiences of this nature with the close encounters that have taken them out of subject-object consciousness. Now, subject object consciousness is pretty much the standard domain here on this planet in which we pretty much see objects as separate. Dr. Janet Colli: I don’t know the technical term for that but yes, when he was in space. When people encounter something that takes them out of their ordinary state of consciousness, pretty much the common state of consciousness for humanity now, and they’re brought into either unity or a higher-order state of consciousness then you look at what caused that to happen and you look at the effect of that. That’s why I’m studying and working with these people, because it is transforming them and bringing them into higher-order states. The mind that is doing that is generally already there. The being that is encountered is already in a higher-order state. It’s kind of like the way the guru system works with shaktipat or Darshan. You step up your vibration to the level of the guru during these periods when you’re in their presence or when they’re giving you an energetic hit. It upgrades your vibration and that’s what’s happening during these encounters. So there are degrees of enlightenment and I want to look at what happens in close encounters when people’s state of consciousness is altered and it affects their whole life. Alex Tsakiris: It’s a fascinating and important body of work on so many levels. I think we’ve tried to touch on some of those, the first being that folks who feel that they’ve been traumatized by these kinds of experiences, there are resources out there for them to process it, deal with it, and hopefully as you’re talking about, actually use it to move forward in their life in a positive way. It’s a wonderful book. It’s going to be very challenging for a lot of our listeners to get into, but I hope we’ve given them a small sense of why they might want to go there and explore this possibility. Again, the book is Sacred Encounters: Spiritual Awakenings During Close Encounters. Dr. Janet Elizabeth Colli is the author. Thanks so much for joining us today, Dr. Colli. Dr. Janet Colli: You’re welcome. Thank you for having me.